If you would like to invest in a tourist location by installing and operating a Ferris Wheel on it, you are in the right place. Ferris Wheels represent are very interesting attractions able to generate good economical returns especially when installed in areas that have easy access for tourists and with nice and panoramic views. Thanks to our design, our Ferris Wheels meet the severe requirements imposed nowadays by cities for these tourist attractions, like having and increased resistance to high speed winds, having a reduced pressure transmitted to the ground and a light visual impact that doesn’t disturb the city skyline. The illumination system proposed is fully programmable and allows operators to change light effect at any moment, like for example creating a new light decoration for Christmas time and adjusting the illumination intensity depending on day and night time. This last is very important in order to reduce the night light pollution to nearby residents. Our closed Cabins allow an incredibly clean view of the surrounding panorama, thanks to our real glass windows. Passengers will be pleasantly freshen up during summer time and warmed up during winter, thanks to our first class A/C system with double Fresh/Heat function, installed on cabin’s roof. 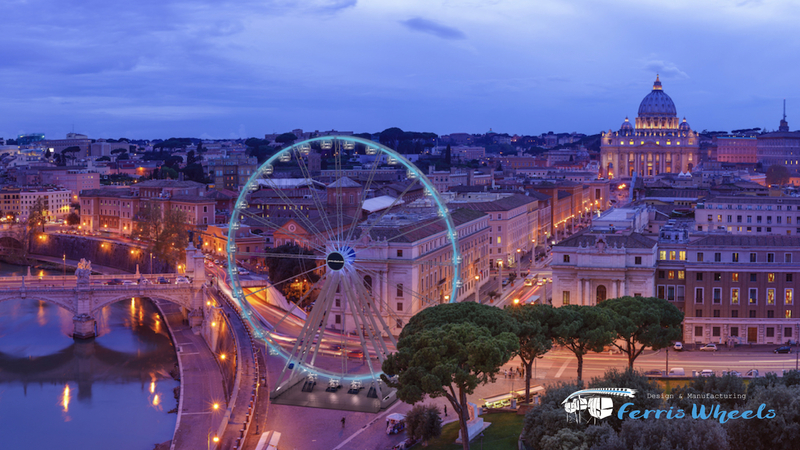 The following rendering images show the visual effect of a Ferris Wheel in an hypothetical site in Miami South Beach and one in Rome, that are among the most popular and visited locations in the world.